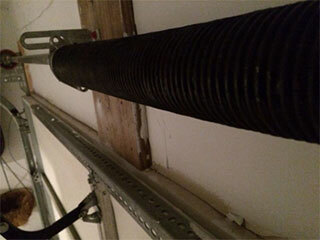 Out of all of the components in your garage door, the springs are possibly the most important. They are needed to ensure that your door is correctly balanced, safely secured to its frame, and is able to operate efficiently and economically. A broken spring could cause damage to other components or may render your door entirely inoperable. That is why our team at Garage Door Repair Longwood is here to help you with replacements, repairs, and maintenance of your garage door springs. Our team has extensive experience when it comes to repairing and replacing broken garage door springs. We understand the importance of the role that they play for your door, and so we work hard to ensure that these components continue to keep your door properly supported and protected. We pride ourselves on our accurate and careful installations. Maintenance is essential for your garage door springs and should be conducted on a regular basis by an experienced technician. Our team can help you inspect, lubricate and replace springs whenever the need arises as part of our comprehensive maintenance services. While all springs have a lifespan, some of them are built to withstand more than others. For those households that require a tougher solution for their doors, we can provide oil tempered and galvanized garage door torsion springs which withstand harsh conditions far better than standard spring solutions. If you would like further information on how our team of professional technicians can assist you with replacements, repairs, and maintenance on garage door springs, feel free to contact us right away or explore our website for more details.